If you are making these for burgers, make the patties larger, so they fill up the bun. 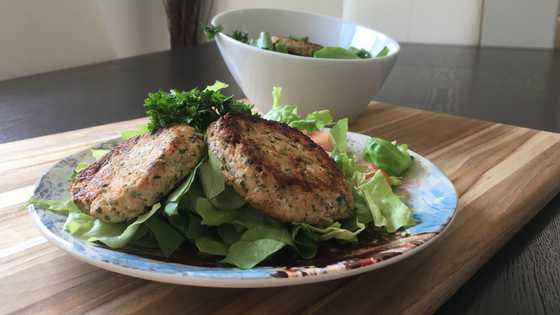 The first time I had them I made them as a salmon cakes and paired it with a salad. The second time, I made burgers with them and I definitely preferred it as a burger. Probably because I smothered it with guacamole. Both options are delicious! Place all ingredients, except for the salmon, into a food processor and pulse until the parsley is chopped. Add the salmon and pulse until the salmon is minced up and everything is blended together. Don’t over blend. You don’t want it to become mushy. A few chunks are okay. Using your hands, grab about ¼ cup of the salmon mixture, roll into a ball and then flatten into a patty. Do this until you have used up all the mixture. I like to refrigerate the patties for about 30 minutes before I cook them. This makes them hold together much better. On medium-high heat, pre-heat a large skillet with extra virgin olive oil, enough to cover the entire bottom of the pan. Once the oil is hot, place in each patty and cook for 3-4 minutes on each side. Serve with your favorite salad, or make tasty salmon burgers.